William Forsyth was one of the most successful and aggressive businessmen in Niagara following the War of 1812. He was a small, thin scrawny man who had been involved in smuggling boats across the Upper Niagara River to his home along the banks of the Welland River. He was known as the king of smuggling which began in 1796 when the border between the Americans and the British was established. He used the profits from his smuggling operation to become the leader in the tourism industry. In 1798, William Forsyth’s father, James Forsyth, received a crown land grant of 388 acres fronting on the Niagara River at the crest of the Horseshoe Falls and the Table Rock except for a sixty-six foot wide military chain reserve along the edge of the gorge. The military chain reserve stretched along the edge of the Niagara River from Lake Erie to Lake Ontario and was used by the military to move men and supplies. This chain reserve is the main reason for the existence of the Niagara Parkway today. In 1817, Forsyth acquired Wilson’s Tavern, which was located on Portage Road above the Table Rock. It was called the Niagara Falls Hotel. In 1818, Forsyth built a covered stairway at the foot of his property which led to the Table Rock and the Horseshoe Falls. In 1818, Forsyth began the first row boat ferry service crossing the Niagara River below the Falls. In 1820, Forsyth began a stage coach service from Black Creek (Buffalo) to Queenston. He later expanded his service to bring visitors from Newark (Niagara on the Lake) and Fort Erie to stay at his Pavilion Hotel. He bribed other stagecoach operators to deliver visitors to his hotel as well. In 1822, in order to keep up with the competition, William Forsyth tore down the old hotel and built a new and larger hotel which he called the “Pavilion Hotel”. Until 1836, the Pavilion Hotel was the best hotel available. The three storey clapboard hotel was elegant by standards of the day. It had balconies which offered the very best views of the Falls. John Brown was Forsyth’s competition. In 1820, Brown built the Ontario House Tavern south of Forsyth’s Pavilion Hotel on the present site of Loretto Academy. Brown used the stairway to the Table Rock that Forsyth had established in 1818. John Brown operated a stage coach service from Clifton (Niagara Falls) to Newark (Niagara on the Lake). In 1827, William Forsyth with the help of John Brown and General Parkhurst Whitney, proprietor of the American Eagle Hotel, staged the first tourist stunt at Niagara Falls by sending the lake schooner “Michigan” with a cargo of live animals over the Falls. In an attempt to monopolize tourism to the Table Rock, Forsyth enclosed the 66 foot military chain reserve which bordered the Niagara Gorge. 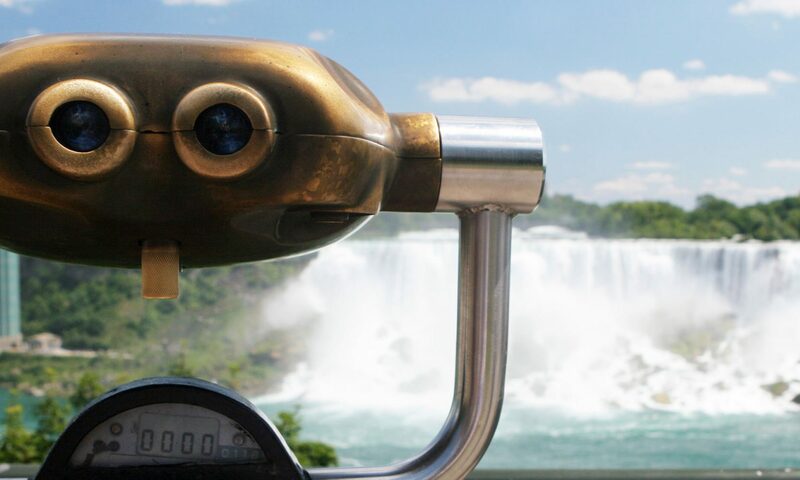 He did so to prevent anyone other than his customers, from getting the best possible view of the Falls. By excluding the general public from the Table Rock and by breaching the chain reserve, Forsyth put himself on a collision course with the government. In 1832, the Government of Upper Canada led by Governor Sir Peregrine Maitland intervened in the chain reserve dispute between Forsyth and the general public. The Government ruled against William Forsyth and this resulted in Forsyth losing all his assets and forced his expulsion to Bertie Township (Fort Erie). The Pavilion Hotel was used as a military barracks during the MacKenzie Rebellion. In 1839, the Pavilion Hotel was destroyed by fire. In 1843, the Pavilion Hotel was rebuilt but was smaller than the original.